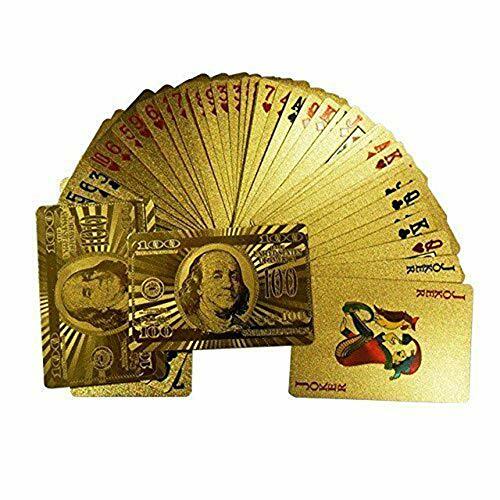 This 24K gold plated foil playing card is made of high quality PET plastic with full of gold foil, looks luxurious and valued.Measures: 2.25 X 3.5 inches(bridge size), Regular index. 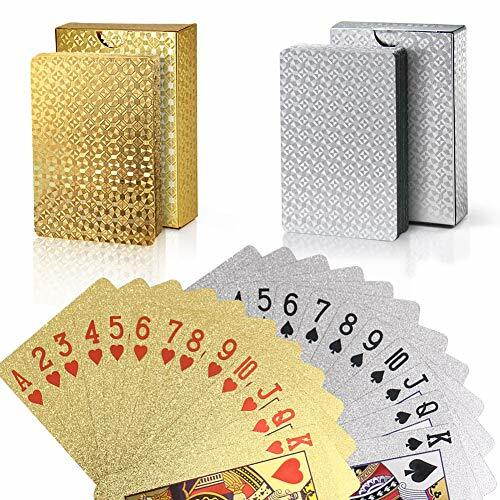 Geometric shaped pattern on the back, a lot classier look.Each deck includes 52 playing cards and 2 Joker cards with 24K gold plated foil box packaged. Features: flexible,durable, shiny, dazzling,water resistant,eco-friendly,colors are not perishable. 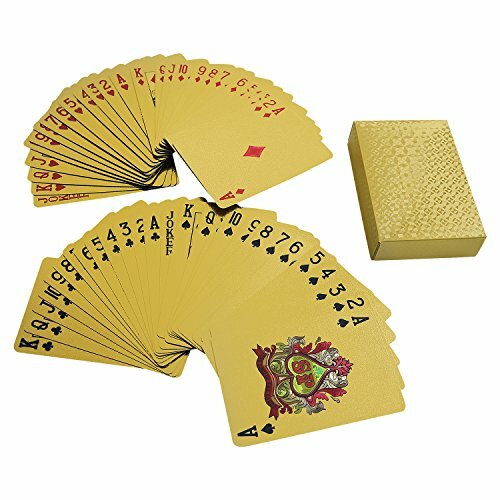 This 24K gold plated foil playing card is made of high quality PET plastic with full of gold foil, looks luxurious and valued.Measures: 2.25 X 3.5 inches(bridge size), Regular index. Franklin 100 dollar bill on card back.Each deck includes 52 playing cards and 2 Joker cards with 24K gold plated foil box packaged. Features: flexible,durable, shiny, dazzling,water resistant,eco-friendly,colors are not perishable. 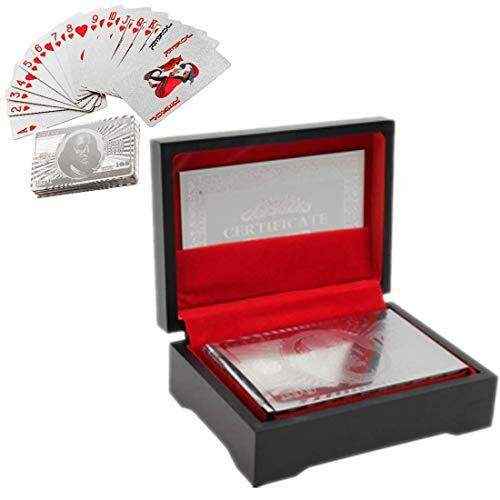 This Standard poker-sized deck of 52 playing cards plus 2 jokers are plated in silver. Playing Cards of Unique Design: The 45th American President Donald Trump. 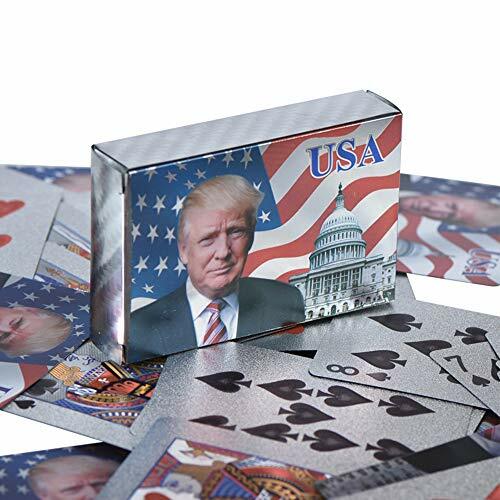 The back of the cards depict a striking detailed image of President Donald Trump with the American Flag in the background.✔Different Experience: Luxury Gold/ Silver Foil Poker Playing Cards Will Give You New Playing Experience. 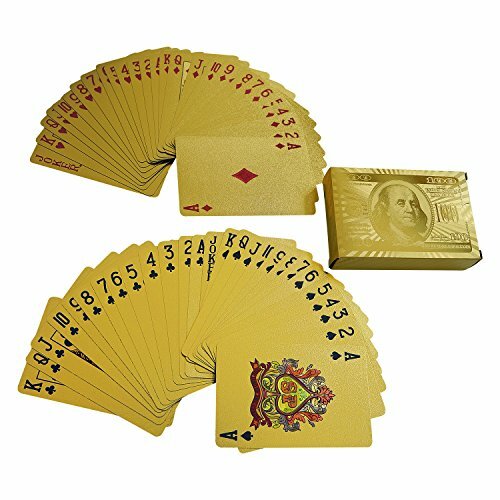 This 24K gold plated foil playing card is made of high quality PET plastic with full of gold foil, looks luxurious and valued.Measures: 2.25 X 3.5 inches(bridge size), Regular index. 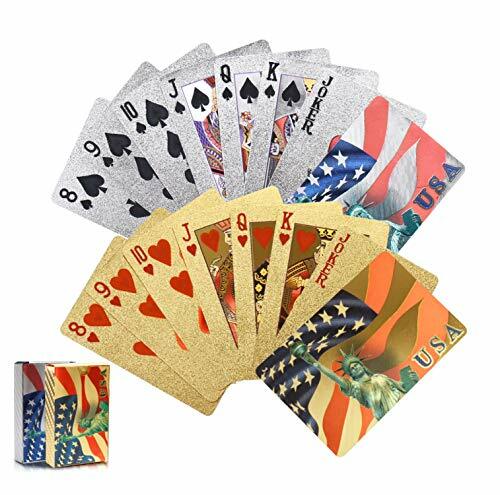 Statue of Liberty and US Flag design back with Color front.Each deck includes 52 playing cards and 2 Joker cards with 24K gold plated foil box packaged. Features: flexible,durable, shiny, dazzling,water resistant,eco-friendly,colors are not perishable. Get the classic Bicycle Playing Cards with a Jumbo index that will give you a clear read of your hand during a competitive game. The jumbo index is great for children's card games as well, teaching them the suits, numbers and letters. Big and bold is the name of this game. This set contains 12 decks of standard playing cards (6 red/6 blue). Each deck is wide (poker) size with a jumbo index. The cards measure 3.5" x 2.5". The cards are made from plastic-coated paper, which makes them durable and easy to clean. The jumbo index is ideal for players who have difficulty reading small numbers. The cards are also perfect for group games that involve cards as the large numbers make them easy for everyone playing to see. 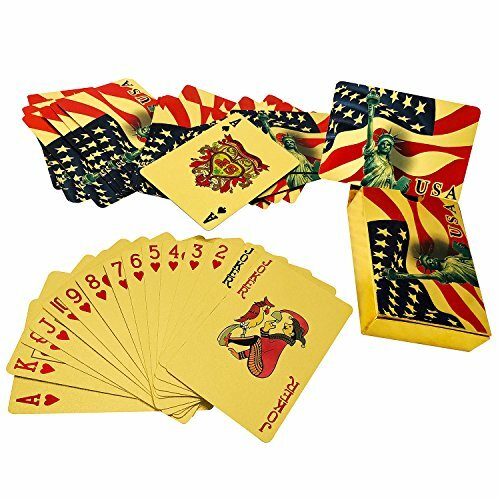 These cards are perfect for use in at-home games, poker tournaments, goody bags, stocking stuffers and more. Each deck contains 52 cards and two jokers. 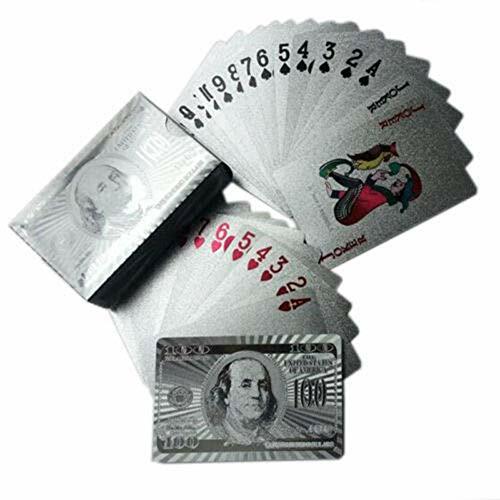 Whether you like poker of bridge, blackjack or spades, you will like it morith this really spiffy set of playing cards. Certificate of authenticitncluded! Play with 5 Star Playing Cards & you'll enjoy Casino Quality at an Exceptional Price. 5 Star Delivers an Unmatched Value that can ONLY be Purchased at Walmart. Play with 5 Star once and you'll be back for more. Many professionals prefer the flexibility and durability of plastic cards. Bicycle Prestige offers unmatched durability and is the only 100 plastic card to offer a paper-like feel. Playing cards are something we either grew up on, saw our elders playing or we still play ourselves. There are endless games to play with a deck of cards. From Go Fish to Gin Rummy to War. Then you have other types of card games like Uno. All these games provide hours of endless fun. With some games, you have to hold a lot of cards in your hand, which is called a suit. With this set of 2, you and a friend can play one of your favorite games without having your hands or fingers get tired or even cramp up from holding so many cards at once. Made from hard plastic, a playing cards holder is such a great invention. These set of 2 hold up to 15 cards, and keep your cards organized. 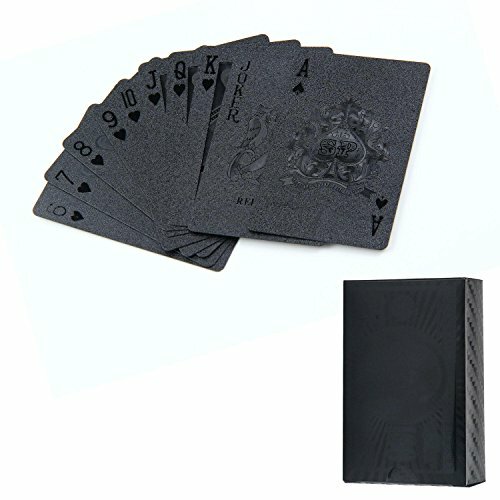 With a playing card holder, they provide so much assistance. They can sit on the table or you can hold them while you play. Either way, everything is off yours hands.